MANILA, Philippines – The Department of Education (DepEd) through the Bureau of Human Resource and Organizational Development (BHROD) named on Friday, June 1 the topnotchers or top passers in the December 2017 Principals' Test. A total of 5,111 out of 20,653 (24.75%) successfully hurdled the exam, DepEd announced on May 29. 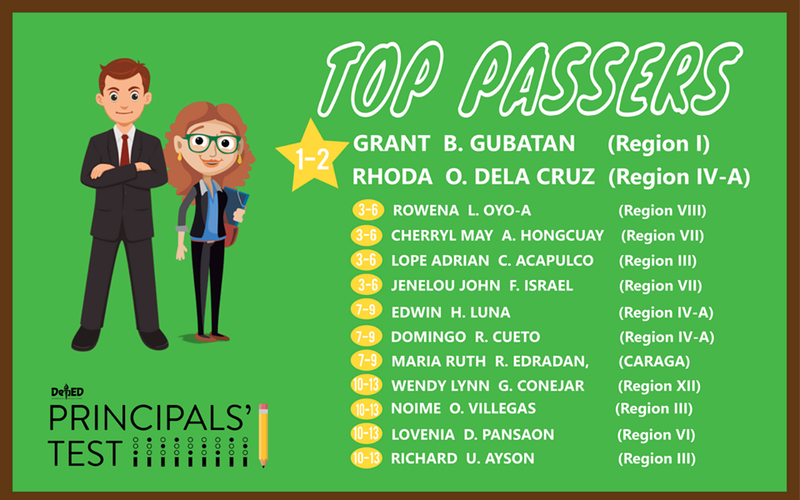 Grant B. Gubatan from Region 1 and Rhoda O. Dela Cruz from Region 4A tied on top spot. It was followed by Rowena L. Oyo-A (Region 8), Cherryl May A. Hongcuay (Region 7), Lope Adrian C. Acapulco (Region 3), Jenelou John F. Israel (Region 7) for 3rd to 6th places.